A large percentage of the wars that have been fought in human history were contested about religion. A person’s religion is a deeply personal choice, and they have regularly been willing to die to defend their beliefs. Taunting someone about his or her religion is simply lowlife behavior. To do it as a means to somehow promote a sporting event is outrageous. Former UFC champion Conor McGregor continues to stoop lower with his behavior. On Tuesday, McGregor posted a photo of archrival Khabib Nurmagomedov with his wife on their wedding day. 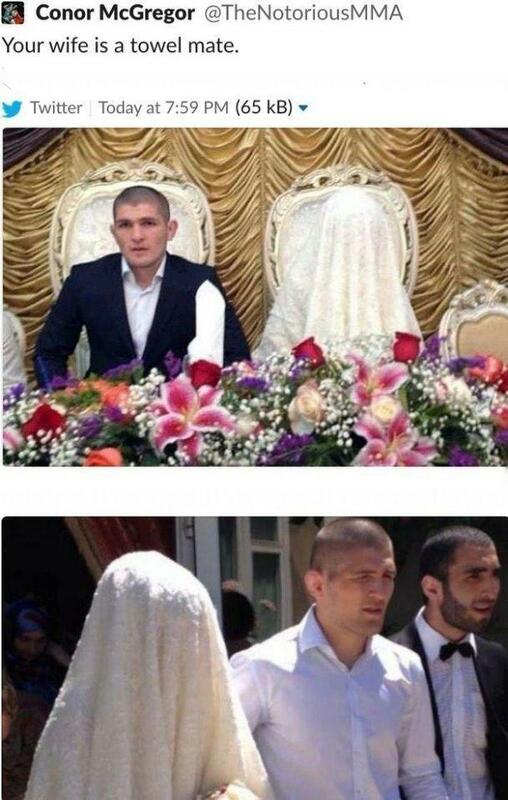 In the tradition of their religion, Nurmagomedov’s wife’s face is covered. Trash talk is a part of sports, and particularly of the fight game. McGregor is one of the best at it, and his talk so outraged then-featherweight champ Jose Aldo in 2014 that Aldo couldn’t wait to attack McGregor. McGregor knew his words would have this impact and that Aldo would charge him at the opening bell of their title fight. Aldo did, McGregor was prepared, and hit him with a vicious counter left hook that lifted him to legendary status. He’d literally called his shot, and “Mystic Mac” was born. The Irishman has too often been willing to cross the line in his use of his trash talk, however. A number of his comments about Aldo and Brazil were edgy and pushed the boundaries if not fully crashed them over. McGregor made racist comments toward Floyd Mayweather when the two were promoting their 2017 boxing match in Las Vegas and has repeatedly taken shots at Nurmagomedov’s religion. This time, at least McGregor seemed to realize he was wrong, because he deleted the offensive tweet with the picture of Nurmagomedov and his wife. Putting that out in the first place, though, was despicable, classless behavior by someone who should know better. McGregor fan boys have led with their chins while jumping into the fray, defending him by decrying the way Muslims treat women. If McGregor were making a human rights issue, it would be one thing. What he did, though, was nothing of the sort. Susan Carland is an Australian academic whose speciality is women in Islam. Have no doubt: That’s what McGregor was attempting to do here. He was in no way, shape or form raising a concern about the human rights of Muslim women. He was trying to humiliate Nurmagomedov and anger him into taking what would be a lucrative rematch. 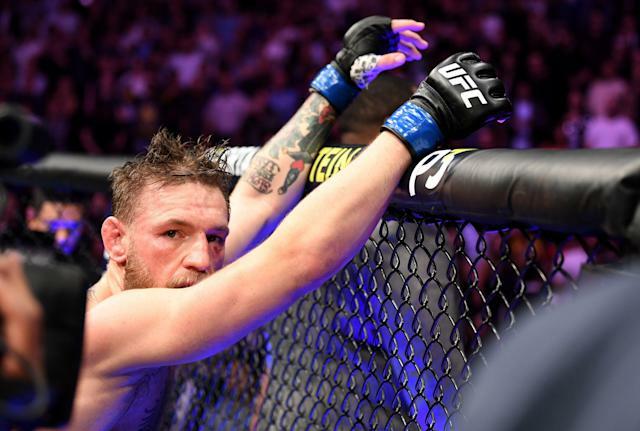 McGregor’s words played a huge role in the melee that followed Nurmagomedov’s dominating fourth-round submission victory over him on Oct. 6 at UFC 229 in Las Vegas. English is Nurmagomedov’s second language, and he wasn’t able to compete in the war of words that McGregor began during the build-up to their fight. Much of what he said was harmless and clearly was just an attempt to drum up interest in the fight. You get the point. It’s not the most eloquent or humorous language, but it was all meant toward raising awareness for the event and selling pay-per-views. It’s more than business, though, when he makes religious attacks, which for some reason he feels the need to do. This, of course, says a lot about who he is since he repeatedly chooses to use this kind of language in public. Nurmagomedov was having none of it, responding with a dig of his own aimed at McGregor’s most recent legal trouble. McGregor is supposedly retired, so the UFC doesn’t have jurisdiction over this. But in the likely event his retirement is a sham and just a marketing play, Dana White and Co. need to address this in the event there is a rematch. If he doesn’t, the arena in which they fight won’t be safe if McGregor continues to take this approach to promotion. 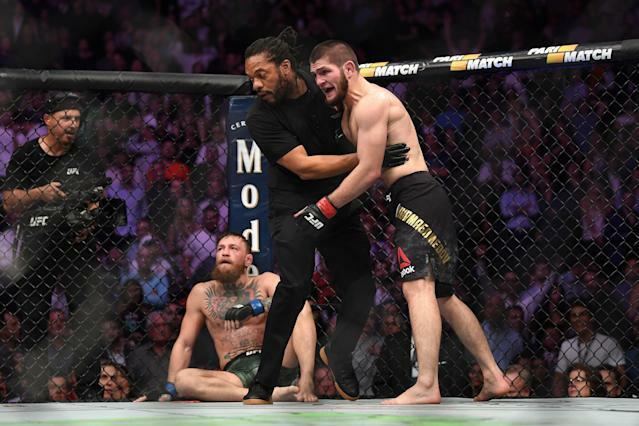 When Nurmagomedov leaped over the cage to go after McGregor corner man Dillon Danis following the fight, it set off a bad chain of events that could have been significantly worse if not for the great work by Las Vegas Metropolitan Police officers and T-Mobile Arena security personnel to contain it so quickly. T-Mobile was a cauldron about to boil over and it’s not hard to envision hordes of fans running from the stands to join the melee at cageside. Nurmagomedov was unquestionably wrong for leaping the fence to get at Danis, but that was all begun by McGregor’s taunts about his family and his religion. Nurmagomedov had never shown that type of behavior before; McGregor, sadly, had. It’s only going to be more tense, and fraught with danger for those who simply want to watch a sporting event, because of McGregor’s lame excuse for a joke. There is not much that’s out of bounds when it comes to trash talk in the fight game, but McGregor has managed to find it. Not only does it make him look small, bigoted and narrow-minded, it creates a public safety issue. It needs to stop and stop immediately and the UFC needs to put out a statement condemning McGregor’s tweet. White loves to say that he never tells his fighters what to say. This, though, is a case where he needs to tell them what not to say, and fast. If he doesn’t, the consequences at what seems like their inevitable rematch could be dire.